The microstructure takes form when a metal goes from its melted formed to a solid metal. 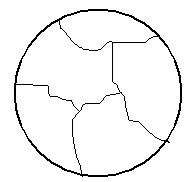 This solidification forms a polycrystalline metal with different orientations of the grains. These grains will form the microstructure. The form of this microstructure depends not only upon the heat transfer but also upon the alloy composition. The two major growth types of microstructures are the dendritic and the eutectic. Both types of growth are present in almost every casting because of a better castability of a near-eutectic or eutectic alloy than that of any other compositions. These two stages will compete deciding whether the final microstructure becomes fine or coarse. Nucleation is the first step but will, depending on the melting condition and alloying elements, hastily be overtaken by the crystal growth, as explained below. Nucleation in a melt will occur when a cluster of metal atoms is ordered in a discrete crystal lattice at or under the solidification temperature. The cluster has a certain critical size, rc, above which it is stable. This critical size rc is dependent on the temperature. When the nucleus is formed the energy will be lower inside the regular crystal lattice than outside in the melt. Then the nucleus will grow at the expense of the melt due to the driving force, which is the free enthalpy. The lower the energy the more stable is the cluster. Grain growth consists of adding new atom layers to an already existing layer on the nucleus. When the melt consists of liquid and a certain amounts of stable nuclei growth will start. There are two basic morphologies of growth in aluminum alloys as already mentioned: dendritic and eutectic. Generally, a mixture of both will be present when aluminum alloys solidify. During nucleation heat will be liberated to the surroundings increasing the temperature of the melt. When the temperature in the melt increases the undercooling will decrease. At a temperature just below the solidification temperature growth will take over and nucleation will cease. 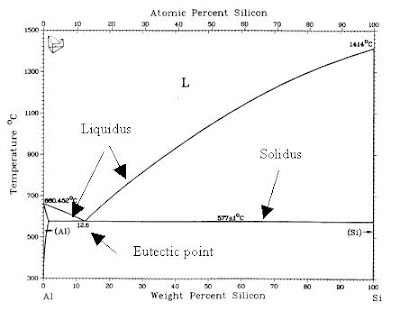 The phase diagram shows what happens during solidification when aluminum is alloyed with silicon. The phase diagram tells nothing about the variation in size of the grains in the microstructure, only which phases the microstructure will consists of for a given composition. The lines in the diagram show, when a phase transformation takes place under equilibrium condition. A phase transformation can for example be liquid to liquid-solid. 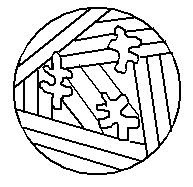 Solidification starts when the liquidus line is intersected. Here the equilibrium exists between the liquid and the solid + liquid. When the solidus line is intersected all liquid will be solidified and phase transformations can only take place by diffusion. When the melt has a content of silicon less than 1.65 wt% the microstructure will start to solidify as primary a-dendrites. Primary due to the fact that these grains are formed in the beginning of the solidification. These dendrites consist of solid aluminum with up to 1.65 wt% silicon in solid solution. The microstructure will be single-phase, only consisting of these a-dendrites grown to a homogeneous grain structure. The size of these grains can be very different dependent on the undercooling and the solidification time. As explained the microstructure will be very fine if the undercooling has been big and hereby caused a high nucleation rate. A fine grained microstructure will give a high strength compared with a coarse grained microstructure. The microstructure obtained when the alloy is hypoeutectic with a silicon content between 1.65 - 12.6 wt% will be two-phase. Again when the liquidus line is reached, the primary a-dendrites starts to solidify. When the eutectic temperature is reached the eutectic phase will begin to solidify between the dendrite arms filling this volume out. The eutectic phase consists of the primary a-aluminum phase and the silicon phase. This will give a two-phase microstructure where the primary a-aluminum crystals are distributed in the eutectic phase as seen in the figure. The ratio between the two phases will depend on the content of silicon and also the solidification time. This microstructure is found in heat treatable aluminum alloys, such as 2xxx series alloy. The first step is heating the alloy to a temperature just below the solidification temperature. This temperature is held until copper is completely in solid solution with aluminum. By rapidly cooling to a temperature in the range of 180 – 220°C a supersaturated solid solution can be obtained. A supersaturated solid is a solid with a higher content of the alloying element than if the solid was in the equilibrium state. During the ageing period elements from the supersaturated solution begin to precipitate. 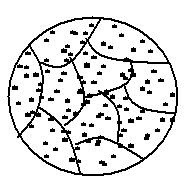 These intermetallic particles can be found in the grain boundaries as seen in the figure.